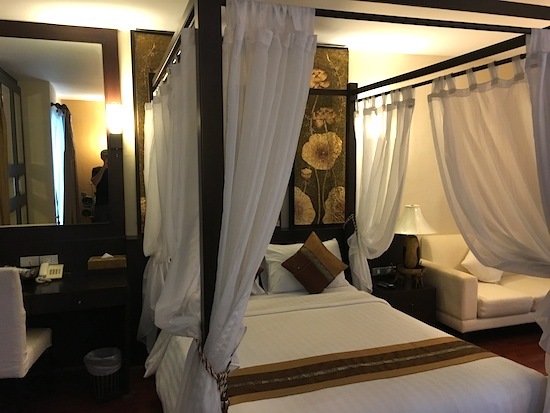 Situated on a quiet side street within easy enough walking distance of both Sathorn and Silom roads, the Mirth Sathorn offers good-size rooms with a classic Thai design. Though it’s not without some minor hiccups, the independent hotel represents solid value in one of Bangkok’s priciest areas. Ad Book now! Rates from US$29.28++. Average rating 7.5 from 763 reviews. 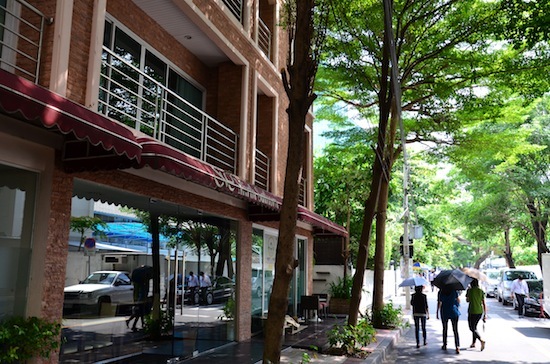 The five-storey brick-and-cement building stands handsomely alongside several tall trees on Sathorn Soi 4. Sathorn Road’s western end is a three-minute stroll to the south, while Silom Road and Sala Daeng BTS station can be reached in 10 minutes on foot via a somewhat tricky route through a couple of narrow lanes. Several bustling areas that burst with street food are within easy reach, but the hotel’s immediate location has a low-key, upscale residential feel. While not the most original design, the owners had reasonable success with a traditional Thai theme relying on dark violets and crimsons punctuated by paintings of saffron waterlilies and swirling metalwork that twinkles gold and silver. Room interiors get points for silk cushions and hardwood floors, though we question the placement of mirrors where there could be windows. Both of the rooms we checked out had only small windows, with the deluxe opening onto a balcony with a street view obstructed by branches. All outfitted with soft mattresses, several different lamps, desks, satellite TVs, average-size hot-water bathrooms, safes and mini-fridges stowed in wooden cabinets, the rooms appeared to be quite comfy. The cheapest superior editions offer considerably more space than what you’ll get at several similarly priced hotels in this area. The deluxe comes with extra room, a loveseat and a four-poster bed. Though we noticed some wear and tear on some of the furnishings, the hotel appeared well kept overall. A lift carries guests up to their rooms, where WiFi is free. The young man who greeted us at reception had a good attitude, though he was all alone so we wouldn’t expect requests to be taken care of quickly. The hotel also has an attached air-con cafe where fresh coffee and simple breakfasts are served. Nearby options in this price range include the Park Saladaeng, The Inn Saladaeng, Silom One Hotel and Cafe Ice Residence. For something swankier (and pricier), check out Triple Two Silom. Check rates at Mirth Sathorn Hotel on Booking.com.